The Prometheus Traction Splint is designed to be used on those patients with a suspected limb fracture. Proper use can decrease the pain and damage caused by the fracture. 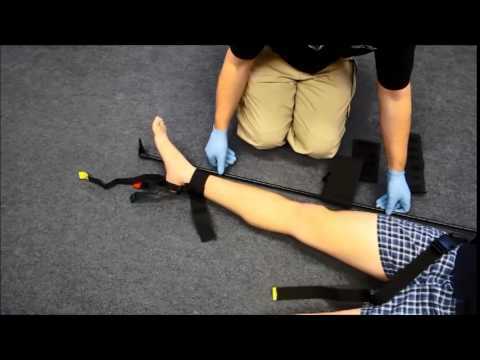 The Prometheus Traction Splint (PTS) was created with valuable input from end-users and has built in features that are an advancement on the traction splints currently available on the market. The Prometheus Traction Splint comes complete with a pole, ankle hitch, lower leg strap, lower thigh strap (fitted to pole) and an upper thigh strap. The pole can be adjusted for length and is robust and durable and the straps are extended to cater for an ever increasingly sized population. Traction splints are most typically used to treat severe midshaft fractures of the femur but also fractures of other limbs. The femur is the longest and strongest bone in the human body; the surrounding muscles (quadriceps) are also incredibly strong. When the femur breaks, the surrounding muscles can spasm and may result in pulling the bone ends past each other, which results in immense pain, bleeding (internal or external), and muscle and nerve damage.